Today, when i start my Internet explorer, a Babylon search comes up front of me, i have tried to change it from “Internet option” however it is again forcefully set my homepage, now i am very disappointed what is this babylon and How do i get rid of Babylon, How do i remove it, I have tried uninstall by control panel, it has uninstalled completely however it is still in my internet explorer and firefox and as well in google chrome. i don’t understand where it has come, is it a virus ? Please help me to completely remove it from my computer. that would very appreciated.. If you arise these type of question in your mind?…Don’t worry about these we have the proper solution for them. How to remove babylon search ?How to get rid of babylon search ? How to Get rid of Babylon ? How to uninstall babylon search ? How to remove babylon search from google chrome ? How to remove babylon search from Internet Explorer ? How to remove babylon search from Firefox ? Sure, We will help you to remove it from your computer completely and permanently as well. you are right it is not a virus but you can say it Adware, because their behavior is seems like that, I am explaining you everything here. This is a affiliated search engine that would provides you the results which is affiliated with google and their adds and when you click on any search result it makes revenue, it doesn’t install without your permission, it doesn’t installed automatically, it doesn’t install only the single installation, it comes along with the other software packages. So be Aware for any other software packages they can offers you to install toolbar first then install the main program. Don’t worry about all the ADWARES we have the proper solution for those, Please follow our below mentioned instruction to how to remove Babylon search from google chrome, Internet explorer, Firefox. Download Adware Remover Tool v3.5.0 to remove Babylon Search Automatically from all of you browsers, This is a Freeware utility specially deigned for Adware Removal. This tool can remove adware from Internet Explorer, Firefox, Mozilla Firefox and their registry as well..
Click on Start button and then click on Control Panel and go to Add/Remove Programs(XP) or Program and Features. Now find out the Babylon Search, Babylon Translator., Delata search, Delta toolbar entry then Right click on it and then click on uninstall. Open Internet Explorer then go to tools menu (press ALT key once to active menu bar) and then click on Internet Option a configuration page will be opened, then click on General tab. Now look into under HOME PAGE Edit Box you got www.babylon.com, replace it to www.google.com, then click on apply and close. Open Mozilla Firefox, Click on tools menu (press ALT key once to active menu bar) then go to Options, after that a configuration page will be opened, then click on General tab and then look on the very first section named as Startup. Under Startup you will see a HOME PAGE Edit Box, under this edit box you will see www.babylon.com, please replace it to www.google.com, then click on apply and close. Now you will a configuration page with search option on the top, so please type “Babylon” into search bar, you will get the result. In the configuration page find a option named as “Open a specific page or set of pages” click on Set Pages, here you will appear the bunch of URL’s (Set pages), you have to delete all them and enter only one which you want to use as your home page. Babylon toolbar is definitely an add-on installed and this is the part of Babylon translation software. This kind of toolbar is actually adware and modifications of your browser’s default search configuration settings. 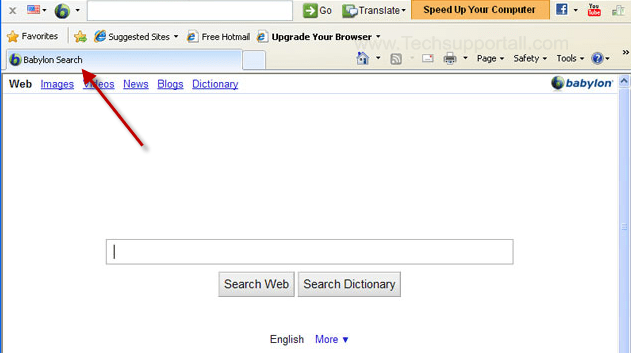 This toolbar makes it possible to execute translations of phrases without having to get around in Babylon’s homepage. Many of Add-ons and toolbars will be included inside of software package installers therefore you should always give consideration though setting them up. Babylon search belongs to PUPs (possibly unnecessary software package). Babylon is a toolbar regarding Internet Explorer that will modifications the Homepage and search engine, additionally, it monitor the searching behavior on the user and make use of this information for specific marketing purpose. Babylon is usually suggested as by way of 3rd party software package affiliations. With every effective setting up, this author will be paid. Therefore you must often be very careful regarding downloads available. Go through the relation to use and if you’re planned to install extra software packages, just reject. These kinds of extra software package aren’t necessary and reduce the computer. A lot of users happen to be whining in regards to the irritating redirection as well as hijacking behaviors of Babylon. Most of them sometimes see it as a malware type virus as well probably high risk. Even so, to purely assess, Babylon is surely an advanced online/offline translation program that is included with lots of language sets and remarkable dictionary, such as built-in dictionaries, community-created dictionaries as well as a text-to-speech adviser to permit end users notice the right pronunciation of words. Many times the thorough manual than it somewhere else, and then we aren’t going to talk about again. This in which a lot of end users would like to get free from such plugin may because of its invasive behavior. Regardless of what, end users requirements be the top priority. Have a look at offer you specific instructions to remove bablyon toolbar and take off search.babylon.com for ones effortless. If you’re in this article, I’m able to only feel that anything like me you’ve found this terrible Babylon search on your computer. I’ll be providing you with several options regarding how to remove this Babylon +Malware from Firefox when that’s the browser I prefer. There are plenty of people which discovered that merely following these types of guidelines have served them remove Babylon, for me however until now these haven’t helped me.Therefore if they never have helped me the reason why have I got chose to make this post? Since i wish to help others which have exactly the same issue and set all options inside the one post within an readable structure. I’m able to hope that these particular recommendations be right for you. How Do I Uninstall Babylon Search ? How Do I Delete Babylon Search ? How To Uninstall Babylon Toolbar ? How To Delete Babylon Toolbar ? What Is Babylon Search ? How to uninstall & remove babylon search ? How do you remove babylon search ? HOW TO REMOVE babylon dictionary ? How to remove a toolbar ? How to remove toolbars ? How to uninstall babylon ? Thanks for the this post !!! I had the same issue but after get your article it have solved..
Babylon is actually an integrated software package that offers translation services along with a globally focused search and toolbar. These extra programs are meant to help complete the Babylon experience and make getting access to all of the information you want even easier. If you don’t want these added features you can easily remove them at any time. Thank you for your valuable comment and information. Thanks for your explained help !!!!! Nice job…works perfect so far…. outstanding! Homepage restored – thankyou so much. If it works I’ll donate more. I hope this works! Have not re-started the computer yet, but I appreciate the effort! Keep up the good fight! I am currently UN-employed; however, upon receiving some-sort of REGULAR Income, I will-(hopefully soon)-be able to send-out a donation….since I Do_Not have ANY of these types of wire/deposit accounts….,but I DO Have you TOOL in my DOWNLOADS folder.,…OBVIOUSLY-for Good Reason! Thank-YOU: Sinc. ; John V.W. I used this adware program and it is working very nicely if it will be very good given performens in future than will try to advertised i used only one time so wil try than i again reply to you .Thank you very much at present first time it is working very well.Keep it up. Thanks! Finally Finally able to get back online outside of safe mode!! ThiS is the second time I’ve had to do this! Don’tthese people have better things to do? Excellent tool . Complementary to Adwcleaner. great job. i will definitely help with whatever little I can donate. amazing tool, keep the good work! Thnks a lot….this is really helpful. Thanks , it is useful for all. First time I’ve donated on the internet and you earned the donation cause you made getting rid of that crap that’s been on my computer for a good year now easy. Thanks! UPDATE: Ran Adware Cleaner and it did the job! Got rid of a load of other crap as well. Many thanks. Thank you so much for clearing the viruses on my lap-top. I use it for classes and was desperate upon seeing the viral attack. I just paid for tuition and books, so I am financially strapped but eternally grateful. Thank you, thank you. This little program Rocks! Found and eliminated multiple Malware issues that Malwarebytes and superantispyware programs both missed. I will be donating to your crewas soon as my Paypal is verified. Keep up the good work! I donated $10.00 today, 28/05/15 Via Pay Pal, Do I have to donate every time? As I’m not that well off, but my PC is very important part of my life so $10.00 is worth the sacrifice. Thank You for This Techsupports! Very good Great The Best. Thanks so much for this good app ! It solved my problem quick and clean ! I suggest it for everyone that has problem with adwares and changing their homepage undesirebale ! It detected Babylon toolbar that I didn’t know that was on the computer. Great job! Have a blest day and thanks for this great tool! I just ran this program for the first time. It found 10 objects and deleted all. Nine of them were “Baylon” which were found in registry. I have never downloaded this before so I don’t know how it got there. All were Internet Explorer related. I have yet to restart my machine and check everything. I’ll have to check with you later. Thank you very much for this software.